Let's say this first: we've never heard a 13-year-old play at this level. Moreover, Slovakian-born,Hungarian gypsy Varady outplays any number of others in the genre, two, three and four times his age. Frightening speed, complex harmony and chording, all delivered with flashes of feel that belie his age. Miles Davis' Donna Lee on electric; Django's Festival 48 on acoustic, Coltrane's Giant Steps - the ambition is as impressive as the raw talent. He's far from fully formed musically - thank goodness -and lest we sound churlish, the over-low action/fretbuzz on Softly As A Morning Sunrise and A Day In New York in particular are distracting. Whatever, the kid's a bona fide prodigy, so buy his album here this very second and invest in the brightest of bright futures. Oh, and David Lyttle's the drummer, just in case you were wondering. Closing date for entries 24 March 2011. The Andreas Varady quartet play prestigious venue Ronnie Scott's in London on March 21. 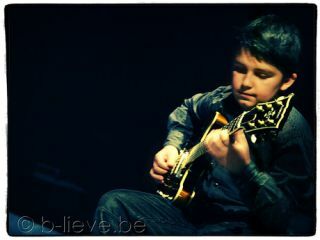 Andreas is the youngest headline act ever for the Soho jazz venue.